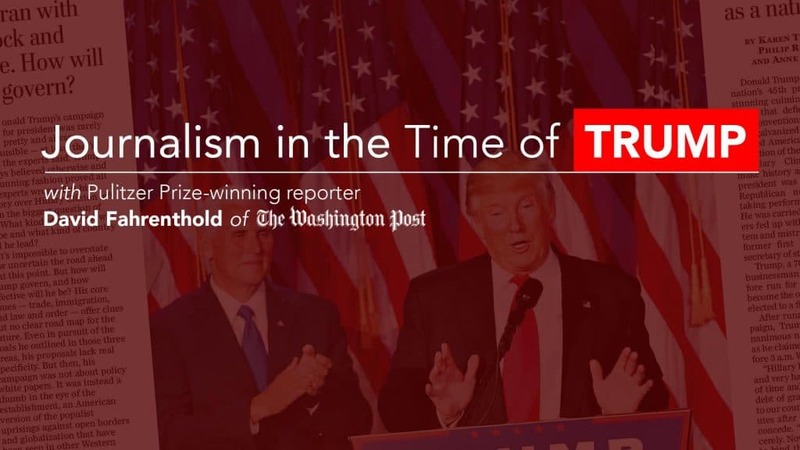 Washington and Lee University’s journalism and mass communications department, along with the Donald W. Reynolds Foundation, will host Washington Post reporter and CNN contributor David A. Fahrenthold on Sept. 26 in Stackhouse Theatre at 5 p.m. His talk, titled “Journalism in the Time of Trump,” is free and open to the public. Following the talk, Fahrenthold will be available to sign his book “Uncovering Trump: The Truth Behind Donald Trump’s Charitable Giving (2017).” The book, a collection of articles from the Washington Post, chronicles then-candidate Trump’s foundation and philanthropic claims. Fahrenthold won the 2017 Pulitzer Prize for his reporting on Trump’s philanthropic claims as well as his story disclosing comments Trump made during an unaired portion of a 2005 interview on “Access Hollywood.” He has been at the Post since 2000 and previously covered the D.C. police, the environment, Congress and the federal bureaucracy. Fahrenthold’s talk will be streamed live at https://livestream.com/wlu/david-fahrenthold.